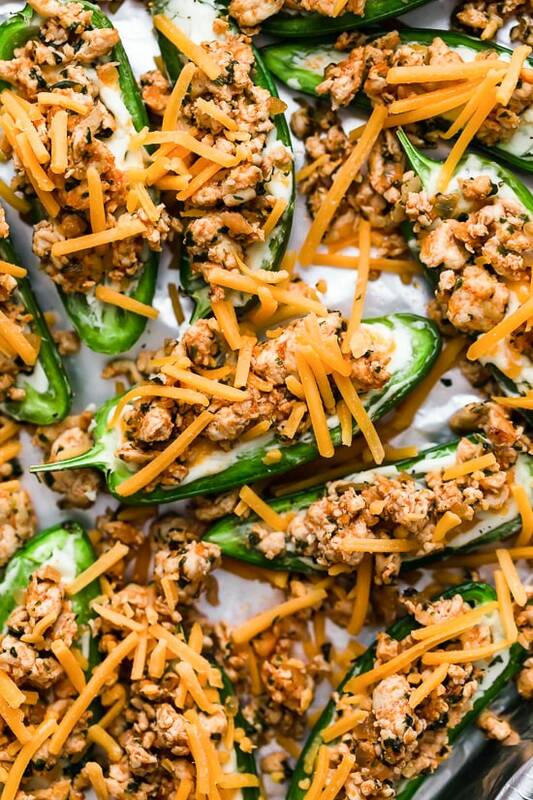 Jalapeno Poppers meet Nachos in this fun, low-carb twist on two classic appetizers, perfect for sharing with your friends this SUPERBOWL! 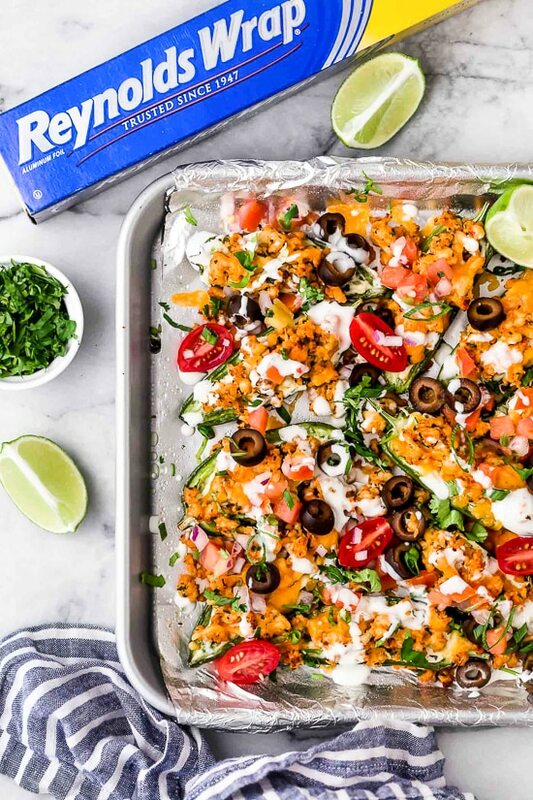 Inspire by my Loaded Mini Bell Pepper Nachos, I spiced things up using jalapeno peppers filled with cream cheese and cheddar instead, before loading on all the toppings! And with the Superbowl right around the corner, I’m excited to bring you another recipe that I created in partnership with Reynolds. If you’re having friends over to watch the big game, your friends will love this appetizer! 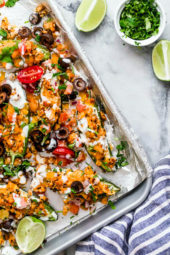 And since I’m sure you’d rather be hanging out with them instead of hanging in the kitchen washing those extra pans, lining your sheet pan with foil is perfect for easy clean up! I used Reynolds Wrap Non-Stick Foil which is made of Heavy-Duty Foil with a Non-Stick coating added on one side (the dull side), which offers a heavier gauge aluminum foil than traditional Reynolds Wrap. It’s made with a food-safe non-stick coating that makes it easy to line pans and wrap your dishes without the added hassle of clean up or non-stick oils and sprays. 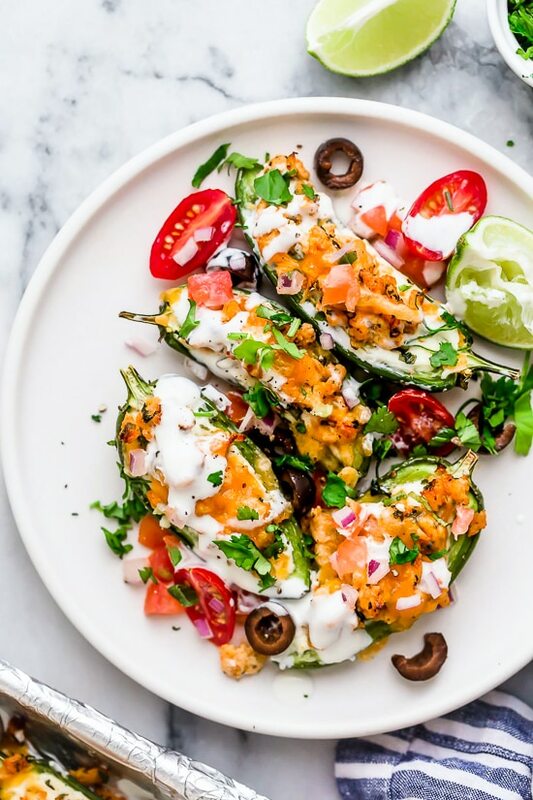 These are a little spicy, very flavorful and a little messy so you might want to serve them with some forks and napkins! They are gluten-free, low-carb and keto-friendly, and will be a crowd-pleaser for sure! Make the turkey mixture and the cream cheese mixture in step 2 and step 3 and refrigerate. Continue with step 4 when ready to cook. 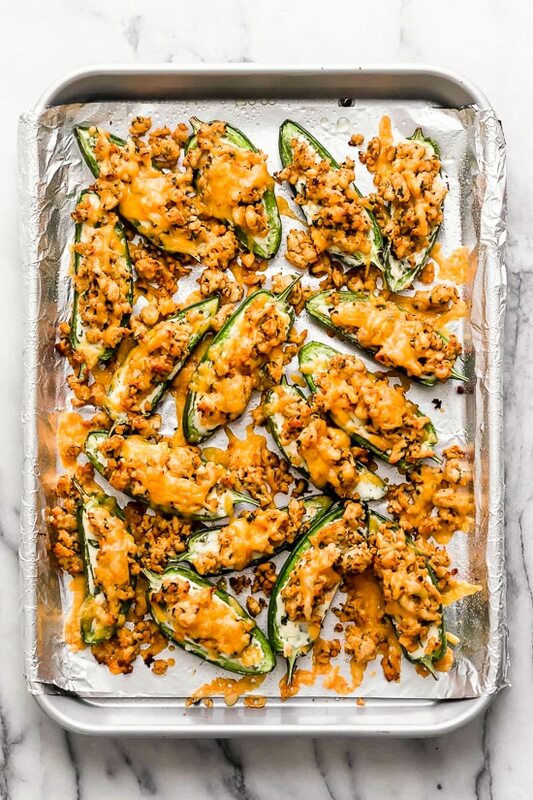 Jalapeno Poppers meet nachos in this fun, low-carb twist of two classic appetizers, perfect for sharing! 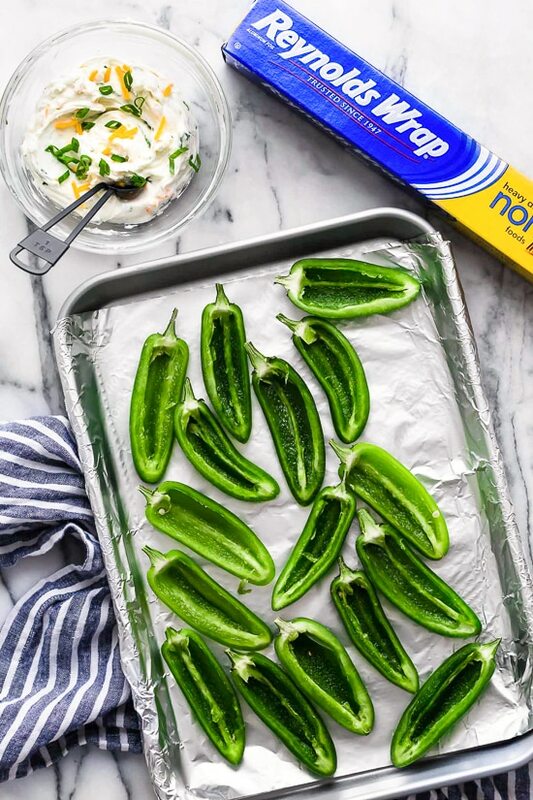 Preheat oven to 400F and line a large baking sheet with nonstick aluminum foil. Heat a medium nonstick skillet over medium heat and spray with oil. Add onion, cilantro and garlic and saute about 2 minutes, until soft. Add ground turkey, salt, garlic powder, cumin and cook meat for 4 to 5 minutes until meat is completely cooked through breaking it up with a spoon. Add the tomato paste and water, mix well and simmer on medium for about 2 to 3 minutes, remove from heat. Meanwhile, combine cream cheese, cheddar and scallions in a medium bowl. 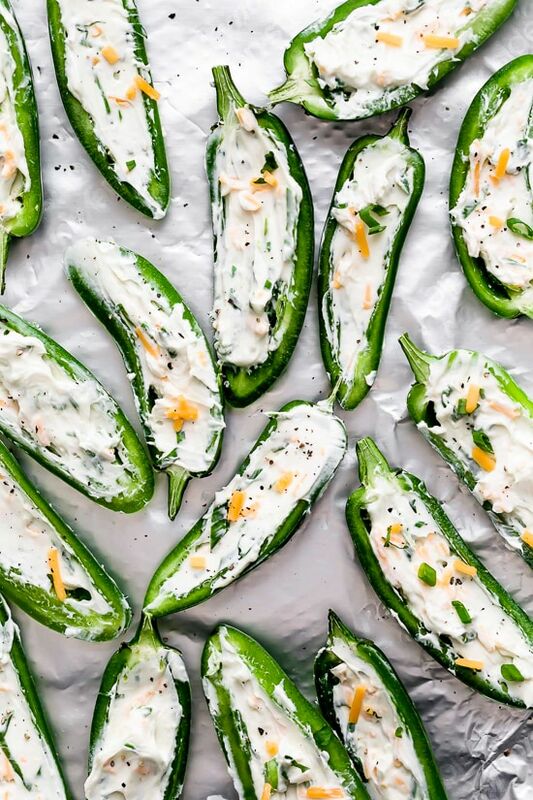 Using a small spoon or a spatula, spoon about 1 teaspoon of the cream cheese filling into the peppers. Arrange in a single layer, cut-side up close together. Bake until soft, about 12 to 15 minutes. Top with meat and cheese and bake until melted, about 3 minutes more. 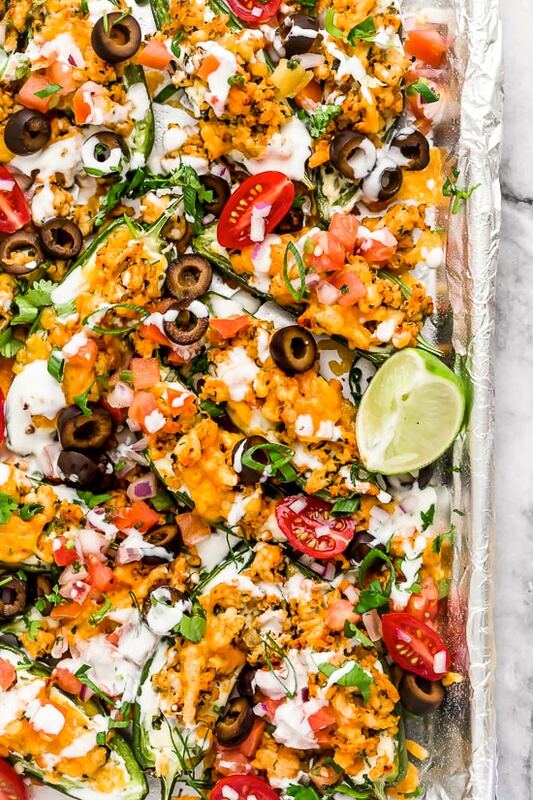 Remove from oven and top with pico de gallo, olives and drizzle with sour cream. Garnish with cilantro and scallions and serve immediately. Disclosure: This post is sponsored by Reynolds. Thank you for supporting the brands that make Skinnytaste possible. All thoughts are my own. Photo credit: Jess Larson.